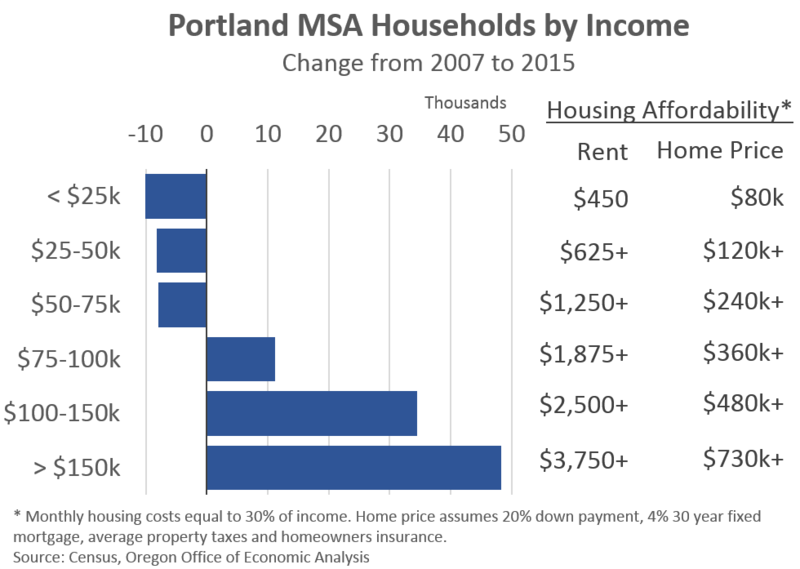 When it comes to the Oregon economy and rising housing costs, one key dynamic seen in the data is the fact that the number of higher-income households are showing the strongest growth. Last year we dove deeper into these changes and we regularly use a chart like the one below in our presentations. While it may look like a fairly simple chart, and it is, there’s really a lot going on here below the surface. One of the major misconceptions regarding the chart is that these changes are due to migration. Well, migration is one part of it, but not the major driver. Other factors like demographics, headship rates, household formation patterns more broadly, and the like all matter. However, the economy appears to be the biggest factor. The number of people with a job, the type of job, and wage growth all matter quite a bit. So it’s really a complex set of circumstances driving this very clear pattern at the topline. In presentations I tell the story of how I have been in 4 of these different bars over this time period. First I had an entry level research job, then I went back to graduate school and earned even less. Then I got a junior position here at the state, and earned a promotion. Furthermore I got married in there too, so while I have jumped around across the different bars, I actually represent a net decrease of one household due to marriage. You know, the whole two (households) become one (household) situation, if you will. OK, back to the migration misconception issue. There is a very simple reason why the overall household trends aren’t due to rich migrants moving to Oregon and plundering our quality of life. Or something like that. The reason is that the majority of newly arrived households actually have lower incomes than the households already living in Oregon. As such, it can’t mathematically work out that migration trends are driving the growth in high-income households. Now, it does not mean there are no rich households moving to Oregon; there are some. But overall, the biggest reason for these patterns if the fact that migration is for the young. Migration rates peak in the college-age years and decline thereafter. This pattern is why our office continually talks about the importance of the root-setting years. Once a regional economy has attracted young, working-age households, they don’t tend to leave and you have them for their prime working-age years. This is the key behind Oregon’s labor force growth over time. And if migration is for the young, it also means it is largely for the lower- and moderate-income households as well. Younger individuals and households, even those with a job, generally earn less money because they are still early in their careers. This is true even as young migrants have higher levels of educational attainment. And this is true among young California and Washington transplants as well. Furthermore, when looking at migrant income trends, these relative patterns hold even for households in their 40s and 50s, see the light blue line in the second chart above. Specifically, among those 35 to 54 years old — ages when very few are just finishing school and beginning their career — newly arrived households do not have significantly higher incomes than the existing population. Another indication that migration is not the key driver behind the household changes by income level. 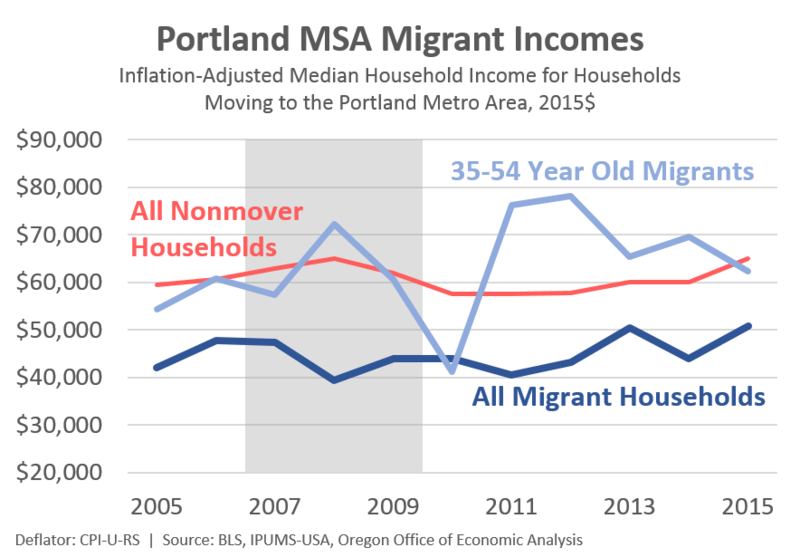 Bottom Line: Despite some rhetoric out there, migration to Oregon is not just for the rich. In fact, migration by itself lowers Oregon incomes in the short-run given migrants tend to be younger and less likely to be employed. Over the long-run, the ability for our regional economy to attract and retain young, working-age households is vital for our growth prospects. Specifically regarding housing affordability, yes, migration does add to demand, but the biggest issue in recent years has been the lack of supply and the reasons why. Note: I have an entire research project focusing on the shifting nature of households by income level, specifically those in the lower income brackets. Given we’re now a few months out from 2016 ACS data being released, the project is on hold until then. I will update the data and release the report at that time. Thanks Annette! Appreciate the kind words and update on the dialogue on the coast. Good morning. I admire your work here, Josh, and your skill at making hard stuff easy. Your commentary about migration has gotten me thinking about something I see in senior housing patterns, and I wonder what your thoughts might be? 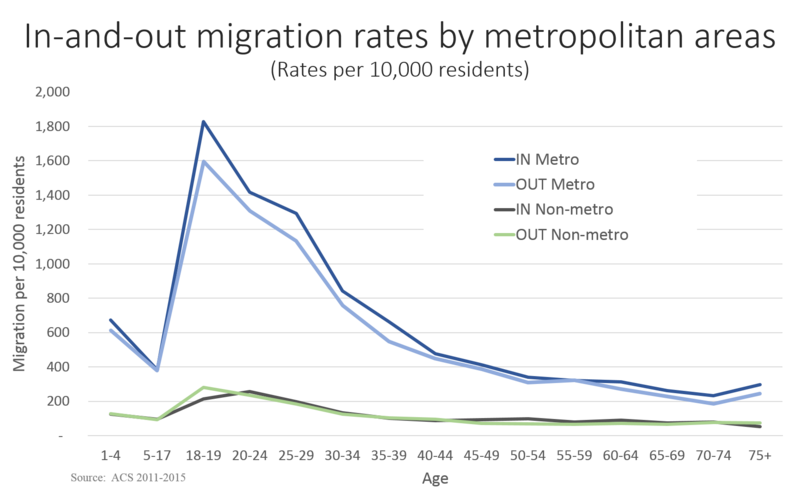 In most metro areas in the NW, I see strong 75+ migration into the metros from “outside” – – the 75+ population rates of increase in the metro areas exceed (sometimes greatly) the larger regional and statewide rates of increase. Since no new 75 year olds are being born, we know these differential rates of increase are probably due to old folks moving around. Be interested in your thoughts. Happy 4th. To your question, it’s a clarification issue. Metro writes that the region gained 37,000 new households. That means the total number of households increased, but makes no distinction as to where they came from. Includes mix of new migrants and aging teenagers and college kids into their young adulthood . Then Metro layers on the income trends on top of the overall change. They’re really different issues, even if potentially related. You can’t just look at the change in the mix of households by income and say the differences are due to migration. That’s not what that data shows. My guess is Metro was trying to go quickly and not get down in the weeds, and thus misconstrued what it actually shows/means.